Happy Tuesday blog family! Are you wondering what these two words have in common? 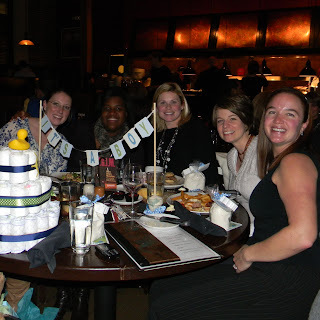 Well about a week ago, Kristyn and I hosted a sprinkle for a friend of ours from the Junior League. This is Lauren's third child, so we did not want to do a traditional shower. 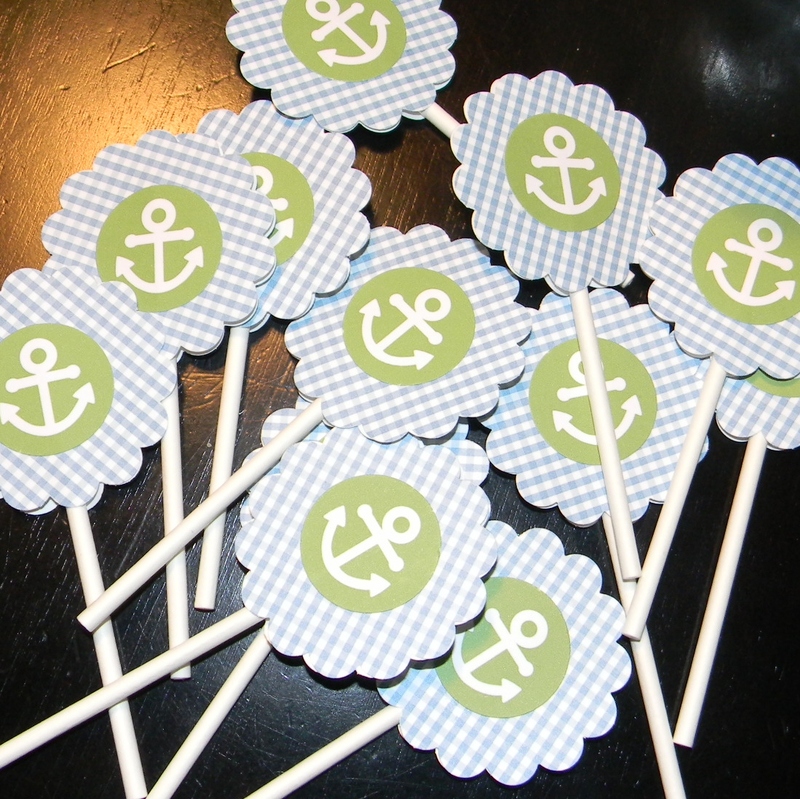 Instead we went with a diapers and wipes sprinkle with a nautical theme. 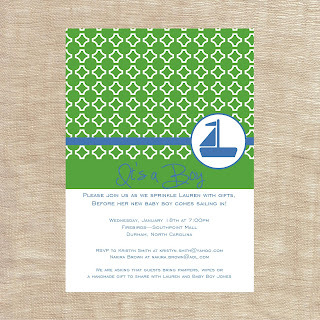 The nautical theme just kind of happened after I created the invitation below and things just took off from there. We had a week to prepare, so I decided to mix some custom design with some Making Memories scrapbook paper that I already had. The event was held at a restaurant, so our first challenge was a banner and how to hang it. 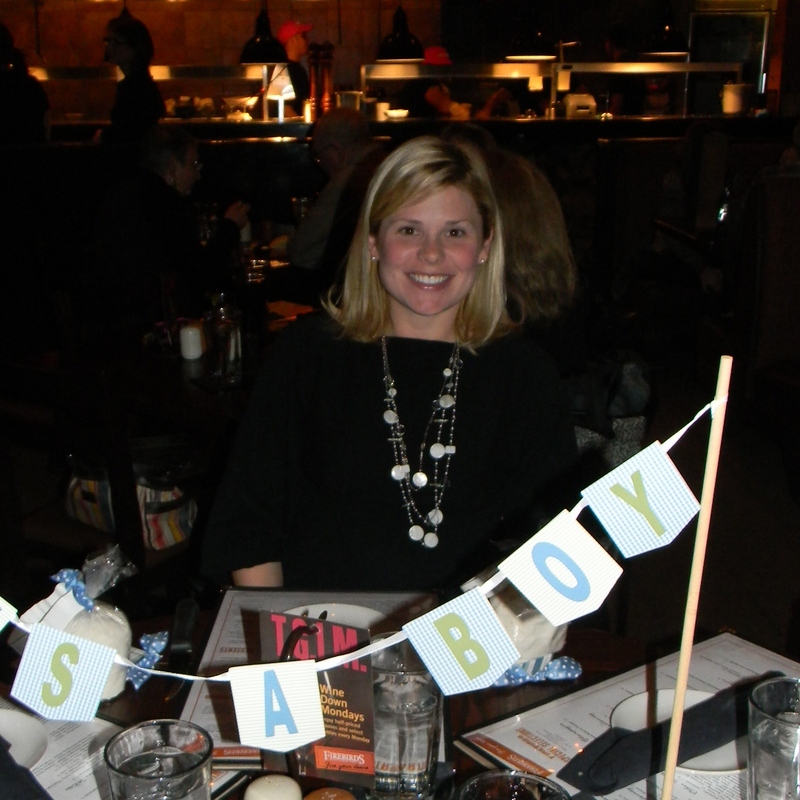 We knew that we would be setting out in the regular dining room, so I decided to make a small banner with "It's A Boy" on both sides (this only works for boy and not girl). I tied the ends to two wood dowels and stick them into foam wedged into glass flower pots that were finished with a ribbon and what else, but sand. (Photo of us all posing with Lauren...next to me). The favor was a fish shaped cookie cutter attached to a bag of sugar cookie mix (store bought). 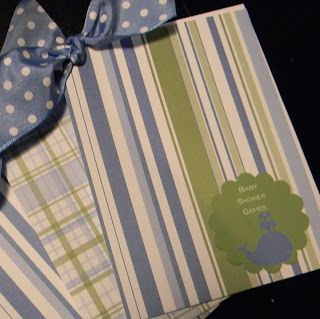 A ribbon held a note of thanks with cooking directions for the cookies on the back. And of course, the sprinkle had to have some games. I created a little game book using some of the store bought paper and added a tag and whale using a Martha Stewart punch. 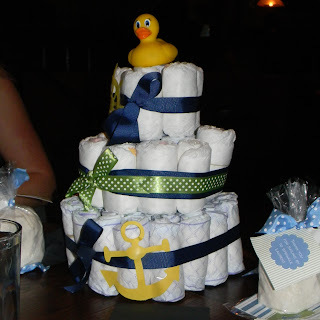 Kristyn created a FABULOUS diaper cake (complete with an anchor :))and we also had some fun cupcake toppers, but we forgot the cupcakes...did I mention that we had only ONE week to plan?!?!?!? We had a great time and Lauren walked away a well stocked mom-to-be x 3!!! If you made it this far, thanks for stopping by! I'm still so impressed with all the things you made! I'll definitely be recruiting your help with my wedding! You and Kristyn did such a great job putting this together! It was such a cute idea and a fun evening! @Kristyn...thank you for the compliment and as far as the wedding, I am at your service. I can also help with day of the event coordination as well. Just LMK! @Lee Ann...thank you so much for stopping by and glad that you had a great time. Looks like we will be gathering again soon to celebrate the upcoming birth of your baby girl!